Onyx Boox Note 32GB Wifi Android e-Lector Pantalla táctil e-Book Tablet-10.3". Onyx Boox Note 32GB Wifi Android 10.3" E-ink Touch Screen E-book Reader. Onyx Boox Note. Stronger WIFI antenna, more stable connection and faster download speed. Had Android 4 with 1GB RAM, 16GB storage and SD card for expansion. Includes reader, stylus, felt cover and the box. ONYX BOOX Note e-Book 10.3 Includes the tablet, pen, usbc type cord with original box. Liks new, I always used cover and never droped. still in warranty. 2019 Upgraded Onyx Boox MAX 2 32GB 13.3" e-ink Fast DHL Express + Bundle Case! 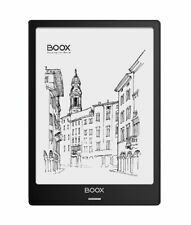 Unlike the closed Linux-based E Ink eReader, BOOX Max2 boasts Android 6.0, which empowers BOOX like never before. It gives you the opportunity to maximize Max2 value. EReader ONYX BOOX MAX 2 Leather Case Cover. 1 BOOX Notenleser. Split-Screen-Ansicht: Sie können EPUB oder MOBI auf einer Seite des Bildschirms und die Notiz-App auf der anderen Seite öffnen. Auf diese Weise können Sie Notizen auf jeder Seite notieren und speichern. Used original case. - power adapter. 258x177x9.5 mm. Battery life?More than 4 weeks (standby mode). Battery capacity?. Audio jack?. 3.5" Earphone jack. Expansion interface?Micro USB. Audio format?WAV, MP3. Images format?PNG, JPG, TIFF,BMP. Original ac adapter, cable, docs. ONYX BOOX Chronos eReader. The given model can be the perfect choice for those who often have to read academic or technical literature. Its large and comfortable for the eyes display with lighting, a powerful processor in combination with 1 GB of RAM are optimal tools for reading PDF and DjVu files. ONYX BOOX Monte Cristo 3 is a device of premium quality for reading electronic books. Pixel density of the screen is 300 dpi which is a record for this type of E Ink screens and corresponds to high-quality paper printing. Onyx Boox Note Plus. WACOM digitizer ensures precise lines. RAM 2GB LPDDR3 32GB Storage. Very sharp with the resolution of 1872x1404 pixels (227dpi) and high contrast (15:1). No glare or reflection. Onyx Boox Note. Stronger WIFI antenna, more stable connection and faster download speed. Surf your favorite pages or upload files or ebooks quickly and conveniently. With integrated Bluetooth 4.0 technology, you can transfer your data without WIFI or use an external keyboard, pedals or audio devices. Model Number: c67ml catrta . Storage: 8G, support the 32G TF card. Is touch screen: Yes. Product Interface: 3.5mm Headphone Jack,Micro USB. Display Color: 16 Gray. Screen Type: E-ink electronic ink screen.